A well presented three bedroom family home, situated in a traffic free setting looking out to a residential Green. The property is conveniently located within walking distance of local shops, schools and bus stops. The accommodation comprises: sitting room/dining room, modern kitchen, modern conservatory with vaulted roof, cloakroom, landing, three bedrooms and a modern family bathroom suite. Externally the property benefits from a low maintenance rear garden that leads to parking area and garage. Viewing recommended. 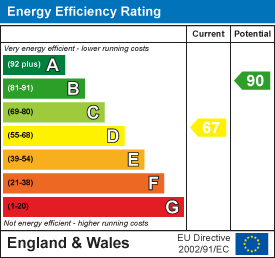 EPC rating D.